A new presenter for Cuddihy’s show On The Record will be announced soon. KIERAN CUDDIHY HAS been announced as the permanent replacement for Paul Williams on the Newstalk Breakfast show. The station announced today that Cuddihy will join Shane Coleman as co-presenter on the breakfast show which airs weekdays from 7am – 9am. On 8 November, Williams announced he was stepping down as co-anchor of the show, which he had presented with Coleman for over two years. 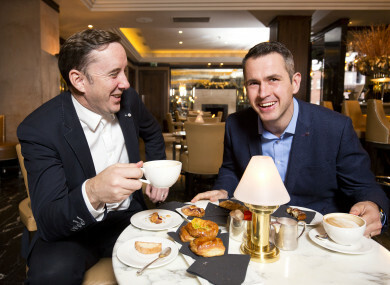 Newstalk Breakfast is described as “a flagship show for the station which currently enjoys it highest ever market share of 6.7% and is a must listen for 25 – 44 year old talk radio listeners”. Cuddihy is a qualified solicitor and is a Kilkenny native. He began his broadcasting career in Canadian radio and joined Newstalk in 2011. In January, Cuddihy began presenting On The Record, the station’s Sunday morning current affairs offering, which has 77,000 listeners. Newstalk said it will announce a new presenter for On The Record “in due course”. Email “Kieran Cuddihy to replace Paul Williams on Newstalk Breakfast”. Feedback on “Kieran Cuddihy to replace Paul Williams on Newstalk Breakfast”.